Welcome to Wow us Wednesdays! We had a lot of great links again last week. Here are just a smidgen of them that I picked out to feature. Worthing Court shared this playroom that her granddaughters play in when she babysits them. So cute! 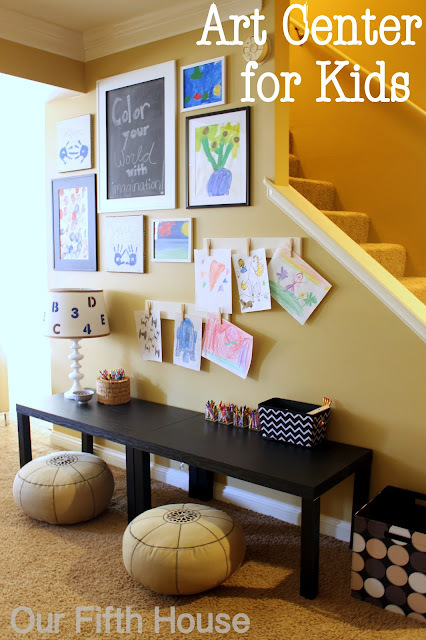 Here is another cute idea for a space for the kids. Unused wall space turned into kids craft area by Our Fifth House. Can you believe this ottoman has been painted. I'm not talking about the legs. The fabric has been painted. Bold move by Oak Ridge Revival. Sandy at Copper n Things found this wonderful old mantel for only $35 and created this beautiful spot outside. I love flavored teas in the summer. Sherry shared how to make this blackberry tea. Find the recipe at The Charm of Home. Cookin Up Good Times shares a strawberry chipotle jam recipe. Rose Petals and Rust shares her dynamic Cecil Brunner roses. I wish I could grow those here. This beautiful outdoor rug was hand painted with a homemade pattern by Serendipity. 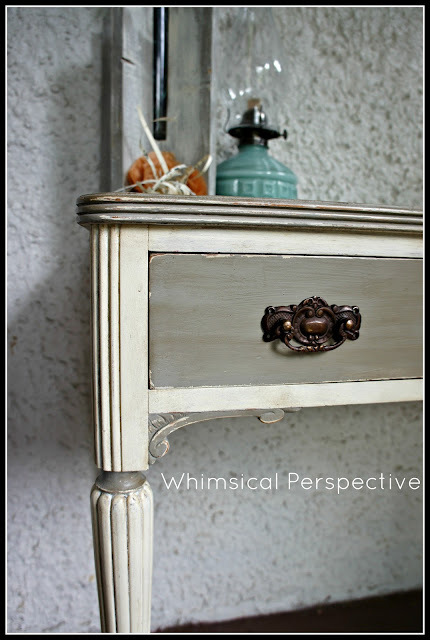 Love the French Linen and Old White chalk paints together on this desk by Whimsical Perspective. Thank you to all of you who joined last week and linked back to the party. I picked up a copy of Cottages and Bungalows today. Great powder room article. That painted ottoman is amazing and those roses ... how I wish! I have a chair that I would love to pain the fabric so I am visiting that ottoman's blog author. Thanks for hosting. Kim, you picked many of the very things I loved most last time. Thanks so much for the party. Looks like there are already plenty of great new things to pour over. Better get busy! I like what you have featured. Thanks for hosting! Great features Kim, as always. Thanks for hosting. Thanks for hosting. I too will check out that painted ottoman. Great features!! Thank you for hosting such a fun party!! thanks for hosting Kim! WOW, I can't get over that hand painted rug! Thanks for hosting your lovely party. I'm all linked up Kim! Thanks so much for hosting! Great party! I always link up! Thanks! Love the features - they are all so fun and colorful! Thanks for hosting! The features look great - can't wait to check them out. This is my first time linking up! Thanks for hosting. Fantastic features - I have been reading more and more posts on painting fabric - very liberating! I shared the cross bottles I got from Artie - thank you once again for hosting the giveaway and for being a great party hostess! Thanks for featuring my tea Kim! You have some lovely links picked out here. Thank you for hosting! Great selections this week, Kim. That ottoman is just amazing. Paint??? Amazing. Great features.I will link up next week after I am done with my kitchen.Have a great week. Hi Kim, Thanks for having me again this week. Hey Kim, just linked up, thanks for always being a wonderful hostess!! Thank you so much for hosting, Kim! I am enthralled by that painted ottoman! Love those playroom ideas. I'm in that grown up "tween" stage of life where my kids don't need a playroom .... and yet I'm still a few years off from being a grandma. Thank you for the feature! I love your link party. That ottoman looks like raw silk in the photos. So pretty! I am off to check out those roses. They look like mine. Thanks for the feature Kim! Andrea's painted ottoman is amazing! I never would have guessed it was painted! Thanks for hosting! So much talent in those features! Hi, Kim, thanks for all of the work you do to host each week. Hi Kim! Thanks so much for hosting this fun party ~ I've just linked up some of my whites to share today. BTW, I'm gearing up for my annual WEDDING BLOG PARTY on June 8th and would so love it if you would come! Stop by and read all about it when you get the chance! for hosting all the fun & inspiration each week! Kim the featured hand painted rug is awesome! Thanks so much for hosting. Great features. I'd love to have that playroom and the outdoor mantel! Love! Thanks for hosting. Hi Kim, I'm loving your party. I love that you featured the painted fabric. That technique seems to be popping up a lot lately and it fascinates me, but since I sew, I'm not that tempted to try it. I linked up my homemade roller shades, but next week, I'll have my slip-covered French settee post to link up, so I'll be back. Great WOW's! Thanks for hosting Kim. thanks for hosting! your letter to pottery barn cracked me up. Oh my goodness there is so much great eye candy going on here! Not just with the features but I spied some amazing links too. Thanks so much for hosting us Kim! Lovely projects! I jumped in this week, hope I did everything correctly! Thank you for hosting another awesome linky party! These are such great ways to meet new bloggy friends and get inspired when life throws you a uncreative curve ball. Liked you on fb- sorry I hadn't done it sooner!! Thanks for hosting, Kim! Great features this week too! Love the art center over at Carmel's Our Fifth House! Thank you for hosting....so many great new links to explore. Off to it!!! I've tried to link up but for some reason it is not working. Any suggestions? I follow all the steps, then when it says it is uploading my image it goes back to your original post. Wow- what a great party. Is it hot there yet? Who would even think to paint the ottoman? Interesting! I would love some of that jam...sounds so good! oh wow...all the wow's you picked are crammed in my head and wanting to be done @ my home! Wonderful ideas! These are a group of very talented ladies for sure, Kim! Wow! What a super great party again this week. Thank you for hosting! You host the best parties! Love all of the features! Love the rug idea. Boy, paint can be a cheap and creative way to add beauty to a home. I'm packing up my Chatty Cathy, Liddle Kiddles and Tipey Toes and heading over to that little girls playroom for a day of playing baby dolls. Beautiful shares! I sure do love that old mantel on the porch! Don't suppose you could do the linking for me ??? Thanks so much for hosting, Kim. So many wonderful ideas and projects!